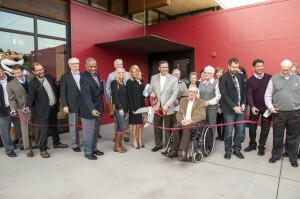 PULLMAN, Wash. – Washington State University’s new visitor center is now open, creating a new front door to the University. WSU leaders, faculty, staff, alumni, friends and members of the surrounding community gathered this morning to formally dedicate the new 4,224-square-foot building. WSU President Elson S. Floyd heralded the new facility as a great partnership between the City of Pullman and the WSU campus. “This is a fantastic day, for today, we officially dedicate the new Washington State University Visitor’s Center. I would like to extend my heartfelt thanks to each and every person—at the university and throughout the community—who played a role in making this remarkable building a reality,” said Floyd. WSU’s “New Front Door” will function as an interpretive center for the university and will highlight WSU’s teaching, research, athletics, student, faculty, and alumni contributions, all in a unique visual setting. Features of the new facilities include an interactive donor recognition wall, other interactive displays and moveable walls featuring student research, faculty research and community outreach. 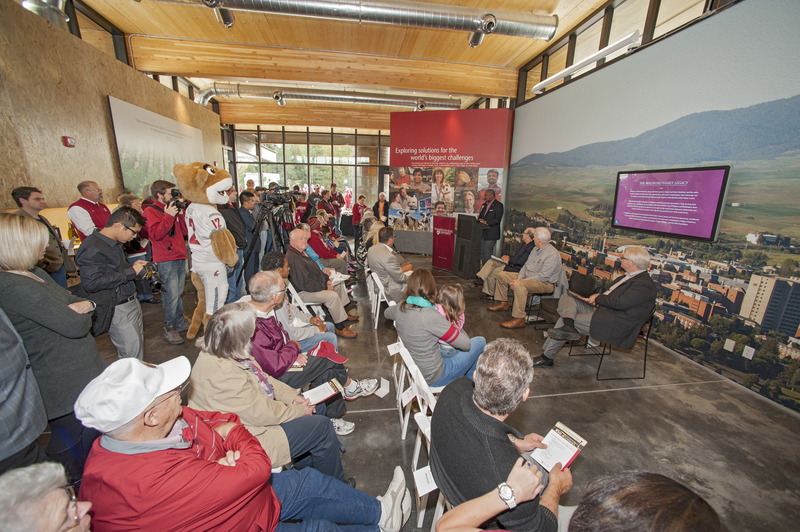 The center will also spotlight the university’s top flight viticulture and enology program, with a wide variety of Wine by Cougars available for purchase. “The new center provides a perfect setting for visitors to learn more about WSU’s hundreds of academic programs, explore the far-reaching activities of researchers, and learn about outreach programs that improve the lives and livelihood for citizens across the state,” said Roger Patterson, vice president, finance and administration at Washington State University. Built at the convergence of WSU’s campus and downtown Pullman, the location celebrates the vitality of the town-gown relationship that has existed between the City of Pullman and WSU for more than 123 years. The building itself is also a showcase of WSU’s research strengths. All wood-based materials used in the construction of the visitor center were developed using technology created by the WSU Composite Materials and Engineering Center, a recognized leader in the development of sustainable composite materials. The Visitor Center is seeking Leadership in Energy and Environmental Design (LEED) certification for the environmentally sustainable construction techniques employed in the building of the facility. Floyd was joined during the ceremony by Duane Jr. and Terri Brelsford and their parents, Duane and Esther Brelsford, to announce a significant gift from the Brelsford family toward the construction of the new visitor center. “When I think of Pullman and WSU, the Brelsford family always come to mind for their tremendous and generous advocacy for a strong town-and-gown relationship that benefits everyone who calls this very special corner of the world home,” said Floyd. The Brelsfords’ history in the City of Pullman and with Washington State University is long. Duane Jr., as well as his parents and daughters were raised in Pullman and graduated from Pullman High School. Duane Jr., his sister, Tracie, as well as he and Terri’s daughter, Nicole, are all graduates of WSU. Their other daughter, Brandi, is a graduate of the neighboring University of Idaho in Moscow. After graduating from WSU in 1981, Duane Jr. went on to pursue a successful career in commercial development in California and Western Washington before eventually creating Corporate Pointe Developers in Pullman about 15 years ago. The Brelsfords are long-time supporters of, and believers in, the quality of life that both the City of Pullman and Washington State University provides. Duane Jr. and Terri have generously contributed to several of WSU’s programs as donors and volunteers for many years, including the College of Business, WSU’s Construction Management Program, Cougar Athletics, and the WSU Foundation. “This particular project—a new WSU visitor center at the crossroads between this great community and its world-class research university—struck a particularly strong chord for our family,” said Duane Brelsford, Jr. 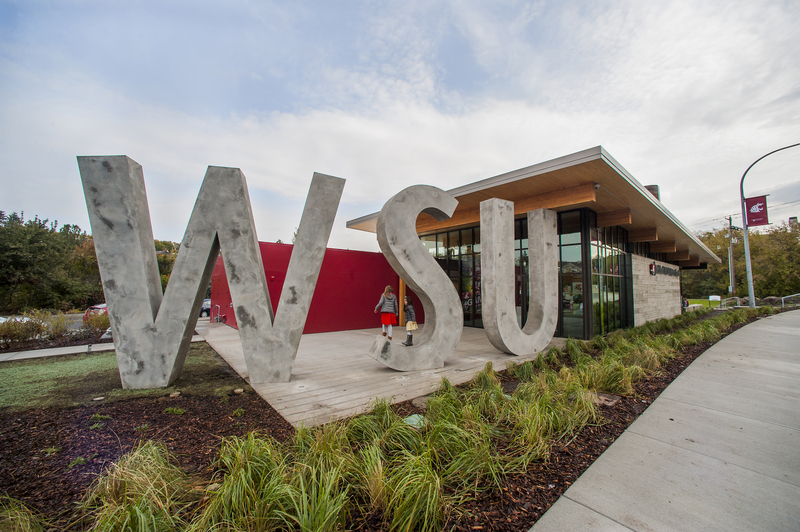 In recognition of the Brelsford family’s generous commitment to the project, WSU’s Board of Regents officially renamed the facility the Brelsford WSU Visitor Center. No state funding was used in the construction of the new facility. In addition to the commitment from the Brelsford family, funds for the $2.5 million facility were pulled together from the sale of the university’s old visitor center and from real estate funds held by the university. 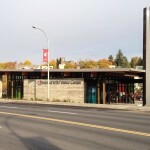 The new visitor center is located at 150 E Spring Street in downtown Pullman. 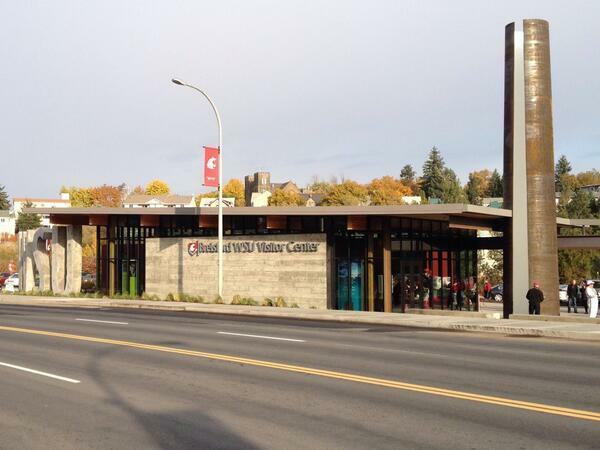 For more information about the Visitor Center, please visit http://www.visitor.wsu.edu.